Shopping at Hermes is something like shopping ‘on sales’. Though the bags are not a penny cheaper, but once the right bag arrives, it goes as fast as it comes. This is obvious for the Birkin and Kelly Bags, but it also applies to the less famous ones like the Hermes Garden Party Bag. It only takes the right colors – like this Duchess version. Hermes took it to the site for a day or two, and then it disappears because they’re out of stock. But Hermes is famous for not putting it back on online, so you have to visit the boutiques to find out whether they have more. The Hermes Duchess Garden Party Bag is designed to look like a ‘royal bag’. The soft red shade is simply irresistible. Mixed it with some of beige and it takes our breath away. This style has joined the House’s Classic Collection for sometime, crafted with Duchess red large Chevron Weave (which you can only see when you’re zoomed-in). The other part is chalk white Country Calfskin and refined with Silver hardware. Oh, there is even a zipped pocket inside, check out the Hermes boutiques for stock. Measuring 36 x 26 x 17 (L x H x D) cm, priced at €1550 euro, £1350 GBP via Hermes boutiques. The Hermes garden party bag has been around for a while. It’s the ideal everyday bag for the modern heiress to flaunt. Carry it whenever you are in need of shopping spree, take it in the evenings and even to work. It’s versatile enough to adapt itself to the summer and winter times, this bag melts like ice cream to your short yellow dress or even your winter coat. If you have never touched the Hermes Garden party, then you haven’t experienced the ultimate smoothness of a luxury. Though available in different leathers, but the buffalo skin is my favorite. This bag holds shape, is smooth and durable. 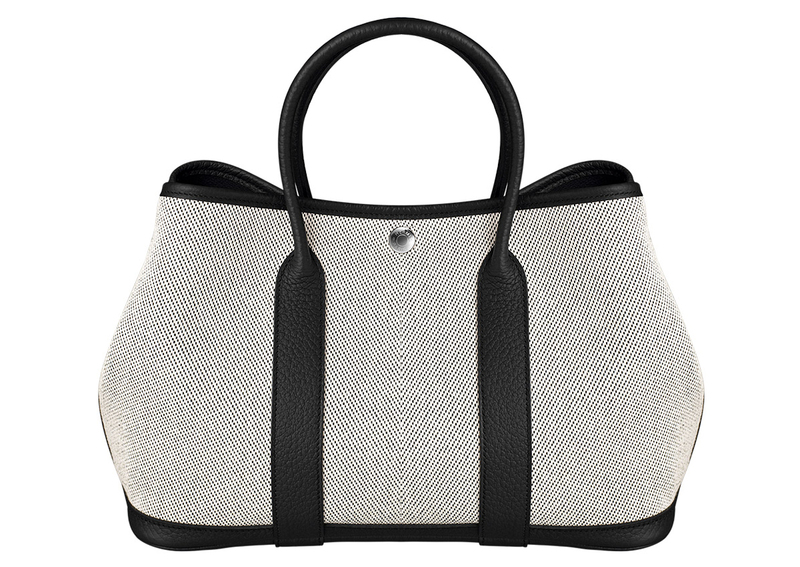 Decorated in silver and palladium plated hardware and it comes with a Clou de Selle snap closure. You can find this bag in two sizes, small and medium. Both of them has enough room to take down all your personal essentials It’s even strong enough to carry your books and thus makes it great for traveling or everyday use. We spotted celebrities like Jordana Brewster toting with their Hermes Garden party, so why wouldn’t you want to try it out? The Garden Party bag comes in a full leather option as I have pictured here and also in a canvas option with leather trim. I don’t particularly go for canvas bodies for bags, so my pick would have to be the full leather version. Hermes says their Garden Party bags are made of negonda leather, which is a soft and supple leather that is also durable and more water resistant with a matte finish. I thought it made sense because the Garden Party bag isn’t one you’d baby, as you would a more structured Birkin or Kelly. It has a more casual, relaxed vibe to it. I could and would take it to work, paired with a business-like white shirt and pencil skirt with heels, because it looks structured enough; but I would also take the same bag when I travel or when I’m out on a weekend, paired with flats, jeans and a polo tee or shirt, and it wouldn’t look out of place! The interior is lined with canvas instead of leather, which is quite natural since the price isn’t as swoon-worthy as many other bags from this uber luxury brand, coming in at about US$3,400 for the medium leather version. I just like how it looks like a workhorse, but an elegant one. Whilst it looks plain, I’ve seen pictures where people dress it up with a scarf or a bag charm to add some visual interest. Also, the leather versions come in beautiful colours including a beautiful bright blue and the signature Hermes orange, which appeals to me because I love colourful bags. But as much as I’d love an orange Garden Party, I think if I were to end up getting one, I’d go for one in Gold or Etoupe. Gold isn’t gold at all, and looks more like a tan while etoupe is a workable cool grey-taupe. Just to get a little more mileage out of it. Granted, there are similar looking options out there from more affordable brands. The Prada Saffiano Luxe Tote has a similar design and vibe, as do many more affordable brands, if you look in Michael Kors, Coach or Kate Spade. For me however, I have my eye set on a leather Garden Party. It looks like something I’d get a lot of use out of, it suits my style and it isn’t obtrusive nor immediately noticeable. I like that in bags. The Valentino Garden Couture Bag Collection is one for the books as another drool-worthy set you should all watch out for! Step into another world as the luxury brand gives you a taste of the season’s finest – large, delicate prints and beautiful colors are the highlights of Garden Couture, and we know you want in! If you want a spectacle to be paired-off with your outfits, then these babies are for you. As you may have noticed, these pieces really do stand out because of their unique designs and extensive craftsmanship (just look at the beading and stitching at some of these pieces). You can get your very own piece from the Garden Couture Bag for pre-order now via Valentino e-store.